It was an angels/demons double team taking on the devils on the “battlefield” of Lucas Oil Stadium in Indianapolis. 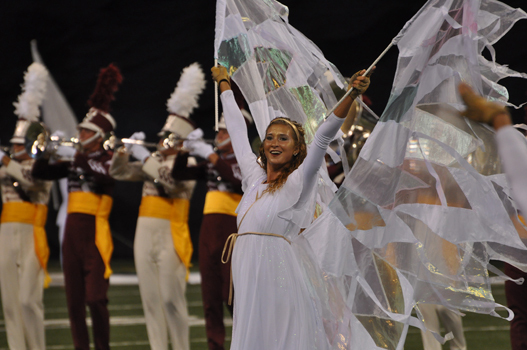 The epic showdown ended with The Cadets capturing its 10th Drum Corps International title on Aug. 13, 2011, denying the reigning champion Blue Devils from capturing a rare three-peat. While on the rain-swept fields of the Open Class Championships, Blue Devils B secured its own three-peat with a third gold medal in as many years. Staged as a celestial battle between good and evil, cream-garbed “angels” against maroon-decked “demons,” the contrasting uniformed Cadets entered from opposing tunnels to a full-throttle show that gave the performers nary a moment of stillness. The left side, led by a graceful angel adorned with wings, stepped in an orderly fashion onto the competitive field while a chaotic right side violently crawled to meet their adversaries, throwing orange marker cones and a crushed mellophone that had seen better days. They retained characterizations throughout their performance, culminating in a battle of percussive proportions. Sacktig, the man behind the complex drill, was instrumental in The Cadets earning the Donald Angelica Best General Effect Award and Best Visual Performance Award, two caption awards determined by averaging scores over the three nights. On the final sheets, The Cadets also took first in Visual Effect, Music Effect, Visual Performance and Music Ensemble—including an uncommon perfect score the night before in three sub-captions. Director George Hopkins describes the uniqueness of the win. “One always hopes that the corps’ best performance is on Saturday evening, but such is rarely the case,” he says. How good was it? “It’s the best finals I’ve ever seen” in 29 years as director, Hopkins says. While 2011 marked the fourth time that The Blue Devils fell short of a three-peat (1978, 1981 and 1998), a mere .575 is all that separated them from five championships in a row. But in this competitive activity, those tenths can turn gold to silver. After back-to-back championship titles in 2009 and 2010, it was going to be a contest right from the beginning. That beginning was June 18 in Saginaw, Texas, where the top four results ended up being the exact reverse order of how they landed in Indy: The Cadets in 4th, The Blue Devils in 3rd, The Cavaliers in 2nd, and Carolina Crown, which won the Jim Ott Best Brass Award, in 1st. The show ended two perfect seasons for The Blue Devils, but not the spirit of the corps. The Blue Devils’ legacy of excellence and style are the foundation for a staggering 14 Drum Corps International World Championship titles, including an unmatched collection of Color Guard titles by again securing the George Zingali Best Color Guard Award for a record setting fourth year in a row. To date, they have taken 15 High Color Guard placements, 13 of these directed by Scott Chandler, program coordinator/ choreographer. “The Beat My Heart Skipped,” a show based on classic 1960’s music from composer Burt Bacharach, explored the sense of community evolving from scattered set pieces to a resolved home. Though Blue Devils B stepped off second to last, they left the field tops in Open Class for the third year in a row. The California corps had a nearly perfect season, winning all but one competition with its show, “Synchronicity.” In three years, Blue Devils B have only lost two shows. Edging out the Oregon Crusaders by three tenths of a point, BDB took 1st in Visual and Music Effect, Music Ensemble and Percussion, earning awards for General Effect and Percussion. In a changed format this year, where the complete lineup of Open Class corps advanced to Preliminary Championships, Blue Devils B went on to place 19th at the World Class semifinals, overtaking four World Class corps. At the helm was DaJuan Brooks, the 19-year-old drum major who accomplished a trifecta of sorts. The first was leading his corps to a DCI Championship. Second was winning a medal in the Individual & Ensemble competition with a perfect score (100) on clarinet. Finally, being awarded DCI’s Jim Jones Leadership Award for Open Class. “I am so happy for DaJuan to be recognized as the recipient of this prestigious award,” Odello says. Touting this summer as its most successful season ever, the Oregon Crusaders took 1st in Visual Performance and Brass. Just as impressive, the group was the only corps to beat Blue Devils B all season. As one of the more competitive seasons, 2011 will be remembered for tight contests and sophisticated yet accessible programs. Even better, in this shaky economy, attendance levels actually rose. Preliminary figures for the 2011 Championships were 36,617, not including VIPs, corps and staff members. Finals-night attendance grew 9.2%, and Open Class Championships had an astounding 30% increase, boding well for the health of the activity. Drum Corps International kicks off its 40th anniversary season in 2012, with championships week from Aug. 6 to 11, 2012. The “Real” Cost of High School Marching Band? 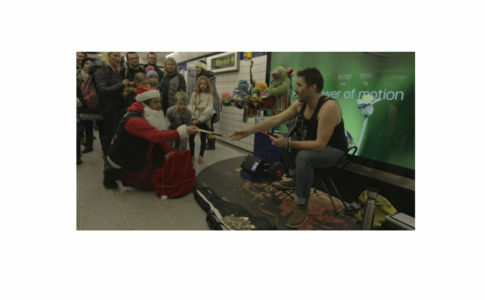 “Saint” Nick D’Addario Spreads Joy to the Street Musicians Across London.